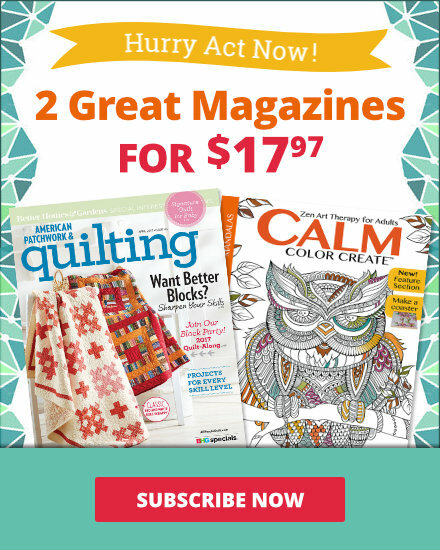 See the featured quilts and web-exclusive color options and projects from the American Patchwork & Quilting June 2018 issue. 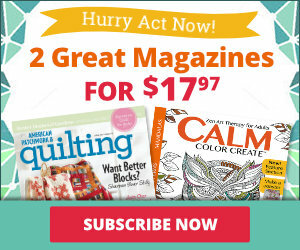 The June 2018 issue of American Patchwork & Quilting is on sale from April 3--June 4. Represent all the colors of the rainbow in a wall hanging. Give it texture with circles featuring raw-edge appliqué and custom machine-quilted motifs. Quilt tester Martha Gamm used flannels to make a soft and cuddly version of Paint Palette. 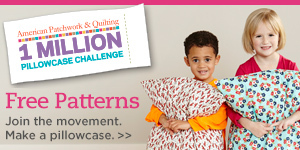 Feed sack-inspired prints in assorted blues pair with solid white to form a dynamic two-color quilt. Combine light, medium, and dark prints in a star block table runner. The trifecta of handwork—piecing, quilting, and embroidery—stars in a wall hanging that evokes a summer garden. "I love making miniature quilts, and red, white, and blue is one of my favorite color combos," group editor Jody Sanders says. "After getting this project quilted and bound, it will join my collection of patriotic quilts that I display in my home all year long." Her great-great-grandmother’s quilt blocks prompted one designer to English-paper-piece hexagons using modern fabrics. Pack a colorful punch with bold floral hexagons that bloom against a solid purple background. 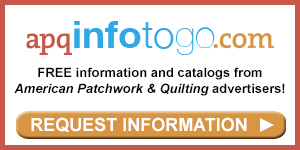 Double Wedding Ring quilts often are made in bright colors. Try a dark blue background for a different look. Group editor Jody Sanders made a table runner using Cherrywood hand-dyed fabrics, which have the look of suede. She mixed a rainbow of hues, including pastels, for an Amish-inspired color palette. Assemble three different projects from one house block. 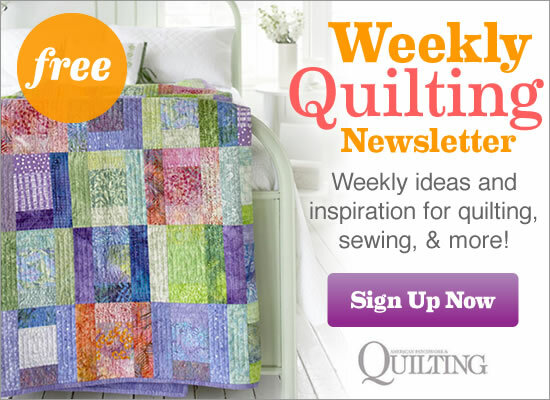 Strip-set construction creates the illusion of woven party streamers in a two-block quilt. Quilt tester Colleen Tauke used just three colors—Cherry Crimson, Deep Ocean, and Vanilla Mist—to piece a wall quilt. By limiting the color palette to a light, a medium, and a dark, she created a three-dimensional look. Though the quilt looks complex, it is composed only of squares and triangle-squares. An assortment of green, blue, and aqua prints shade diagonally across a wall quilt. Primary colors appear to echo against low-contrast fabrics in oversize, offset Log Cabin-inspired blocks. Quilt tester Colleen Tauke used solids in different shades of gray and paired them with saturated aqua, lime green, and purple to make a Log Cabin block. It would make a striking table topper or piece of wall art. Enhance a decorative throw pillow with needle-turn appliqué and hand-embroidered embellishments. Instead of needle-turn appliqué, quilt tester Colleen Tauke used a fusible-web method to secure her batik shapes. If you use this method, be sure to reverse the appliqué shapes when cutting them out. Once she had fused the appliqués in place, she machine-blanket-stitched them to the dark blue batik foundation.